I like to reach out to people, especially in hospitals and the medical community, with my main focus on bringing comfort to those suffering from chronic pain and illness. I do this through my art, a kind hello and a gentle smile with patients, their families, friends and staff. This makes me feel good and people say it gives them hope and inspiration. I’m very thankful and proud of what I can do. Cristina Powell dedicates her life to helping others who are suffering from chronic pain and illnesses. She lightens their hearts with her warm smile and kind words, gives them courage by sharing the story of her own medical challenges, and enriches their lives with her beautiful, happy art. Because Cristina has journeyed through the difficulties of Cerebral Palsy, she is especially able to listen to and embrace those who are suffering – with love, sensitivity and a knowing compassion. 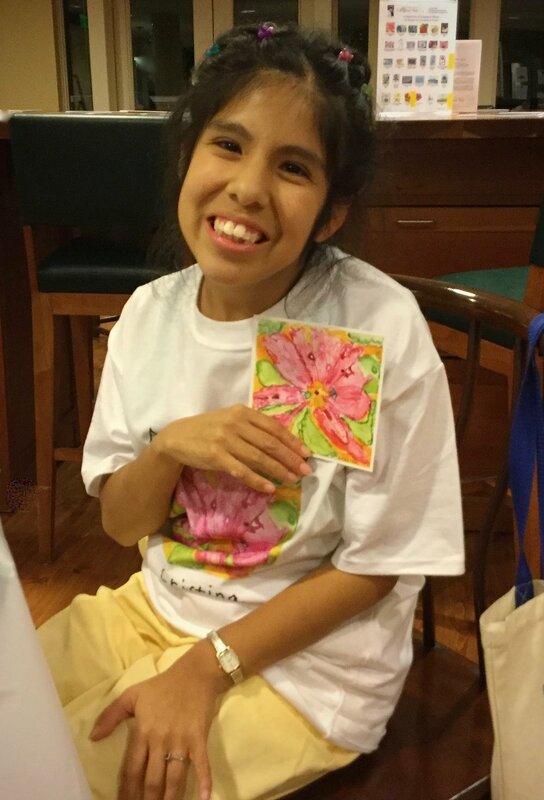 Through sharing her story, donating her artwork, and participating in community events, Cristina helps others find hope, comfort, and the courage to meet life’s challenges in A Brighter Way. Thanks to the help of Harvard Law School and the U.S. Pain Foundation (USPF), A Brighter Way is officially an independent 501(c)(3) non-profit foundation. We will continue our mission to bring hope, inspiration, comfort and joy, even healing through art, to all!